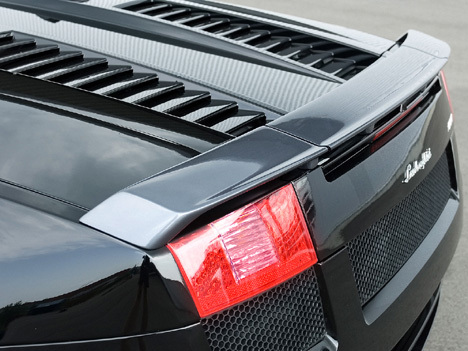 Hamann have wasted no time in creating a styling and tuning package for the baby Lamborghini. 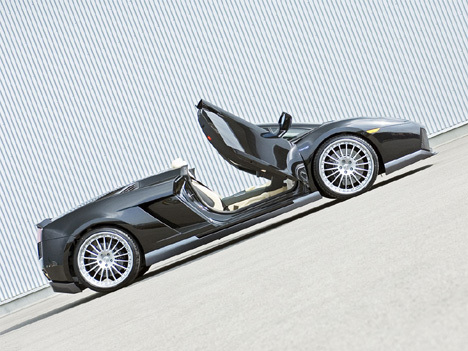 On the style side of things, Hamann have added (ironically) ‘Lamborghini’ style door hinges, to enable them to swing up and open. A front spoiler is added with a racing style adjustable lip, sill extensions, a three piece rear wing and a rear diffuser which compliments the Hamann quad tailpipes. The new exhaust and sports cats coupled with a little engine management tweaking, produces another 30 bhp from the 5L V12, taking the top speed just 1 mph away from the magic 200. The brakes discs are increased to a handy 380 mm and 360 mm, with eight piston front calipers and six piston rears, it’ll have no problem slowing down, so you can see your reflection in shop windows. The forged ‘Anniversary II’ wheels are available in 19 and 20 inch diameter.